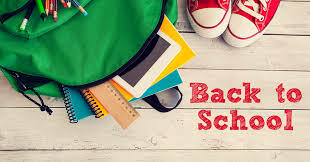 Back to school… As a kid it meant getting new shoes, picking out a few cute outfits, and a book satchel (for those younger than me that is the equivalent of a backpack). Back in the old days the event came much later in the year- closer to September. I remember summers that seemed to never end, with plenty of days of boredom after the library’s reading program and tennis lessons had come to an end. This summer vacation consisted of sixty-three days, including weekends, and I know this because I am now on the other end of the back to school spectrum- I’m a teacher. Both teachers and students feel the freshness that comes with a new start. Teachers come up with ways to improve their instruction, and even the most reluctant learner is encouraged by the clean slate at the beginning of the year. I used to tell my students that on day one everyone has a 100, they just need to maintain it by working hard. As we all adjust to setting an alarm clock again, teachers and students alike long for a little more sleep. I have become a firm believer that my body functions much better when I get up with the sun and pretty much go to bed when it does. I especially felt that this morning when I was already at the gym working out a few minutes after 5 am. I can hear you haters out there grumbling about how you always have to have an alarm clock and how you would love to get out of the habit and have to adjust back after sixty-three days. It wasn’t that long ago that I was among you. I haven’t always been a teacher. Entering the teaching profession at the age of forty-eight was a little unusual to say the least. After working for years on my degrees and teaching certification, I was finally ready to get a job, and at that time there were not very many to go around. I knew the competition would be tough. Those cute, twenty-something blondes bursting with ideas and charisma and young coaches that the athletic program had to have got most of the jobs I interviewed for. The school year had already started and I thought I was going to have to take a job as a paraprofessional making a tiny salary just to get my foot in the door somewhere when I got called for an interview at the end of August. Because I had done almost every kind of job and was more mature (code word for old), I was selected to step into a classroom at Douglas County High School by Tim Scott, Vicki Burnett, and Amanda Thornton to which I will always be grateful. I needed my maturity and the perseverance I had developed over the years to survive my first year. You see teaching is not for the faint of heart. High school students can be very intimidating, and as a high school teacher you have to design your lessons to get your class to learn the expected standards. Countless hours went into creating lessons, activities, and tests, then grading all of their work. By the end of the year I understood what summer vacation was for! Without that sixty-three day break to forget how hard the job is, nobody would continue to teach. So as you find yourself stuck behind a school bus making stops, remember to appreciate all those involved in the education process. It is often a thankless job that is virtually impossible, but it can be the most rewarding thing in the world to think that you helped prepare a young person for their next step. Even if you are years beyond going back to school, you should pretend and get yourself a new outfit and a shiny new pair of shoes. It is that time of year, and we never stop learning!